Strike Force commences another campaign when he runs at Caulfield on Saturday along with Lord Barrington in the same race. Both horses are in race nine, the Keno Jackpots Benchmark 84 Handicap over 1200m with apprentices claiming on both. Mitchell Aitken is aboard Strike Force (pictured), who will jump from barrier four. The five-year-old has not raced since his trip to the Gold Coast for the Magic Millions race on January 13 but appears to have come back as good as ever according to Racing Manager Anthony Feroce. 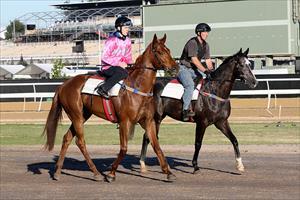 “His jump outs have been first rate and his work this week has been excellent,” Feroce said. “With the minimum 54kg and from that draw he should be able to position himself just behind the speed. “He will be better over a little further but he did kick off last campaign at Geelong in the Dual Choice Plate over 1200m and was only beaten half a length. Zac Spain reduced Lord Barrington’s weight to the minimum 54kg and is racing well, runner-up to Princeton Spirit over 1200m at Moonee Valley on June 16. “He has worked impressively this week and has won previously at Caulfield,” Feroce said. “It is a step up in class for him but he gets compensated for that with the minimum weight to carry and he is in good form.